It may be one of the most photographed destinations in the world, but that doesn’t mean it’s overdone, overrated, or over in any way. Aside from its obvious beauty, the timeless island of Santorini is a treasure trove of hidden gems: Cycladic culture, delicious local gastronomy, dreamy landscapes, and exceptional real estate opportunities. It’s no secret that the Greek isle of Santorini is high on the bucket list of many, if not all, globetrotters. A result of a devastating volcanic eruption in the 16th century, its mesmerizing landscape – rugged terrain, rustic hills, steep cliffs, idyllic pebbled beaches, turquoise waters of the Aegean Sea, and breathtaking vistas of the sun setting over the Caldera – has become an international sensation, stealing the hearts of vacationers from around the world. Those who want this moment of pure beauty to last a little longer than a few summer weeks don’t hesitate to take the plunge and invest in luxury property in Santorini. Clusters of 19th-century mansions, traditional whitewashed homes, and bright blue domes set the quintessential charm of Santorini – the one we know, love, and dream about. But tucked away in quiet local towns, like the prehistoric settlement of Akrotiri, are private luxury residences making very attractive appearances on the Cycladic real estate market. Most exceptional villas for sale on the island Santorini offer their very own wellness areas (spas), swimming pools, delightful outdoor spaces, and sublime panoramas of volcanoes, the sea, and mysterious islands in the distance. This Mediterranean island is not only a paradise for vacationers, but also for savvy investors. Consider acquiring an entire residential complex in the heart of Ftelakia with nearly 10 acres, sweeping views, multiple villas and studios to be renovated or built however the owner (you) sees fit. An ideal situation for vacation rentals in the Cyclades, don’t be surprised when legions of tourists and holidaymakers start knocking at your door. A promising investment, the island’s tourism programs are willing to subsidize large-scale acquisitions on the island of Santorini. Not bad, not bad at all. Since its terrain-changing catastrophe, the island of Santorini has reemerged as an otherworldly natural beauty. But with a closer look, you will find that this idyllic island is scattered with contemporary luxuries waiting for you to discover and indulge in. After all, that’s what vacations are for! 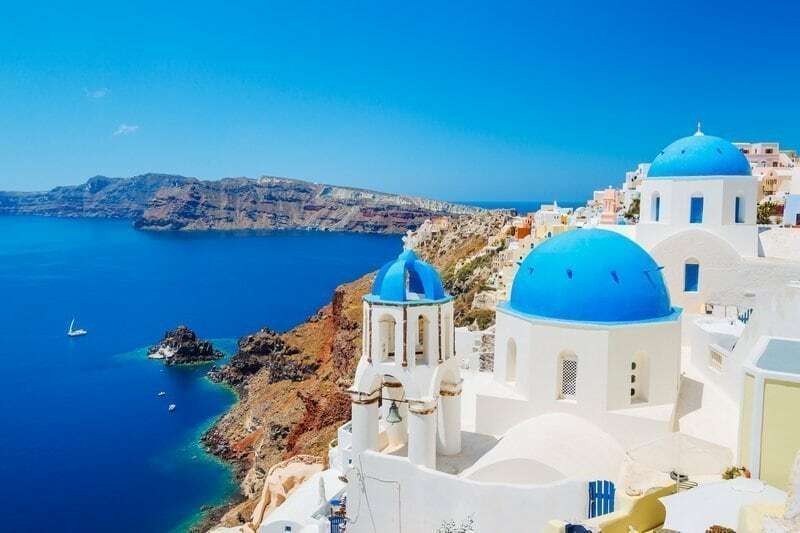 After touching land at Santorini International Airport, days can be spent beach-hopping, tanning on lava pebbles varying in shades of black, red, and white, soaking up the Mediterranean sun, and cooling off in swim-friendly waters. Exploring the small towns and villages of Santorini won’t disappoint either. From the capital city of Fira to hotspots like Oia, Thira Stefani, and Akrotiri, you will encounter beautiful discoveries: romantic restaurants overlooking the Aegean, designer boutiques carrying both big and small brands, tiny shops stocked with authentic Cycladic craftwork, live-music bars, cafes serving smoothies with as much care as coffee, and other exciting local finds. Just ask your BARNES Greece agent. Santorini is not at all isolated. There are several smalls islands nearby that can be visited with just a short yacht ride. However, we’re warning you, the atmosphere in Santorini is so hospitable that you will no doubt be tempted to add a few extra weeks onto your stay. The solution? Easy: Buy a luxury property on the island of Santorini with BARNES Greece.